What better way to start the day than to greet someone “good morning”! Sending a good morning message will undoubtedly make them happy. Several studies show that an increase in happiness increases the productivity of a person. A positive change in attitude can significantly lessen stress in day-to day activities. Less stress means more productivity! You can help your friend, significant other, colleague, boss, family or even a complete stranger in pursuit of success by sharing happiness in the morning. You can message them on their phone, email them, or share it on several social media sites such as Facebook, Twitter, Instagram and Tumblr. 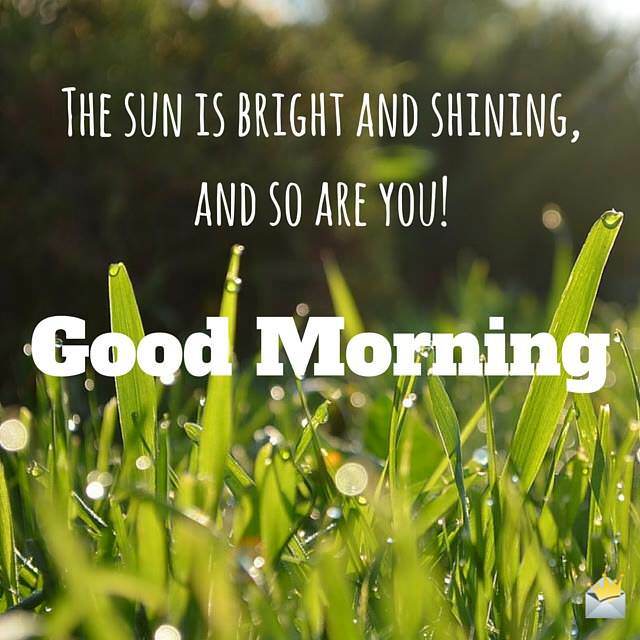 If you’re having a hard time coming up with good morning messages, you can easily choose from these fantastic good morning quotes! You can start conquering the day when you have conquered the snooze button. Wake up and seize the day! Good morning! The sun is bright and shining, and so are you! Go out and spread some sunshine to the world! Have a great day! Smile! It’s a beautiful morning, but not as beautiful as you. Good morning! I hope you have a beautiful day! Get up! Stand up! Everything’s going to be great today. I’m sure you’ll have a fantastic day. A great day full of opportunities is ahead! Wake up and be ready to grab them. Good morning! Today is another chance to make your dreams come true. Don’t waste it! Good morning! I wake each morning thinking about you and how blessed I am to have you in my life. You have given me so much happiness. And so, I wish for you a happy morning. Let the good times roll! Wake up and stretch. Have a good day! The world is such a wonderful place to be, and today is a wonderful day to be happy. Share the happiness! Good morning! A good day starts by smiling. Smile and let the world know how beautiful the day is supposed to be. Good morning! It may be hard to get out of bed, but it is harder to stay in bed knowing how fun the day will be. So rise and shine! The fun starts when you get up! The moon said goodbye, the sun said hello, I say good morning and so should you! What do we say to the snooze button? “Not today, not today”. Good morning! Do you know what’s beautiful in the morning? Your smile. Show your beautiful smile to the world! Have a wonderful morning. A productive workday lies ahead if we start early. Wake up now and have a fruitful day! Fruits are good in the morning. Eat some for breakfast and enjoy a fruitful day! Don’t let your dreams stay in your sleep, wake up and make them come true. Good morning! Don’t let your tomorrows be full of sorrows. Do what you need to do today and enjoy the next wonderful day! Good day! Great things come to those who feel great in the morning. I wish you a great morning! Your smile is as sweet as maple syrup on my morning pancakes, or cereal on my bowl. My morning can’t be complete without it. So smile, and have a great morning! Let the world know how happy life can be! Share with them your good morning smile! Don’t feel low, I’m here to say hello! The sun is bright, so seize the day with all your might! Have a great day! There is no assurance that today is going to be easy. But it doesn’t mean it is going to be hard. No need to be scared, all you have to do is face the day with everything you’ve got. Good morning! I like mornings best. It’s the time of the day when you are given the chance to make another great life moment. Have great morning! Roll out of bed and do what you have to do! It won’t do it by itself. Go on, and have a good morning! The diva has woken up! The world is sure to have another fabulous day! The world is ready for you, so get ready for the world! Have a wonderful morning! Feel accomplished tonight by doing your responsibilities early on today. Wake up and start doing things right! Good morning! Don’t be selfish, share your good vibes to the world! Good morning! You are the most beautiful thing in the morning. I am sure you are going to enjoy this beautiful day! Be ready to face this awesome day! Eat some breakfast, do some exercise, and smile! Good morning! Don’t miss a single great thing in the morning! Wake up early and have an awesome today! Success comes to those who are ready for it. Wake up and start getting ready! Have a successful day! Don’t just wish for an awesome day, make it one! Good morning! Don’t let your dreams go to waste! Use this day to make them come true! Have a good morning! A good day starts with a good cup of coffee. Drink yours and get ready to have another good day! Good morning! Every good thing starts by doing something good. Share the goodness you have on this good day! Good morning! Every day can be awesome if you just let it be. Don’t start your day with negativity. Smile and the world will smile back! Have a nice day! Wherever you are in the world, I know you’re going to have one of the best days of your life today if you just get out of bed and start doing the best you can. Good morning! Do everything extraordinarily well today and I promise you today is going to be fantastic! Have an extraordinary day! No matter what happens today, always wear your best smile. Don’t forget, your smile is one of the best things you can share to this world. Good morning! Mornings are nice. Everybody is so fresh and hopeful. I hope you are too! Good morning! You shine brighter than the sun. Your smile is prettier than the rainbow. I hope you continue sharing your colorful smile to the world. Have a fantastic day!